Loose Ends 13—14, diptych, acrylic on canvas, 500x170cm, 2018. Loose Ends 12, acrylic on canvas, 250x160cm, 2018. Loose Ends 15, acrylic on canvas, 250x160cm, 2018. Loose Ends 11, acrylic on canvas, 250x160cm, 2018. LONDON — 2 August, 2018. For immediate release. 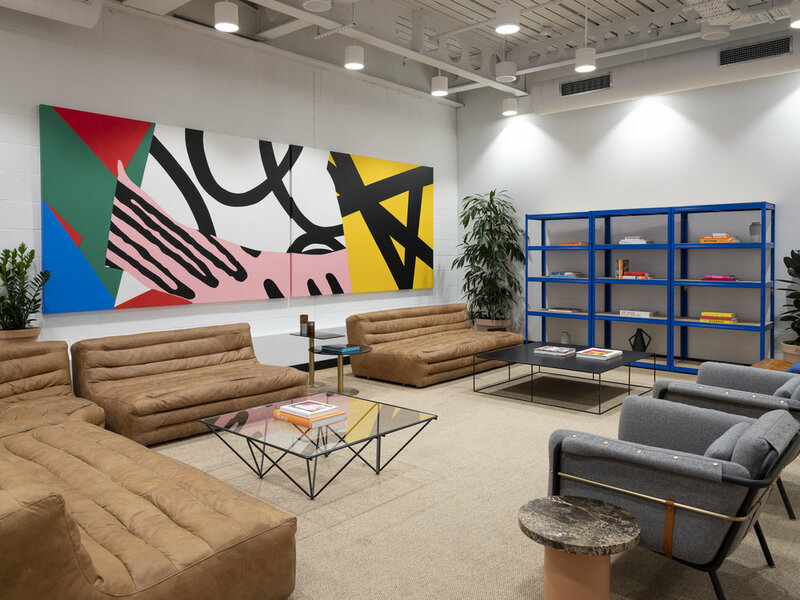 A few moments walk from Moorgate Underground Station is the new Finsbury Pavement location of co-working superpower; WeWork. 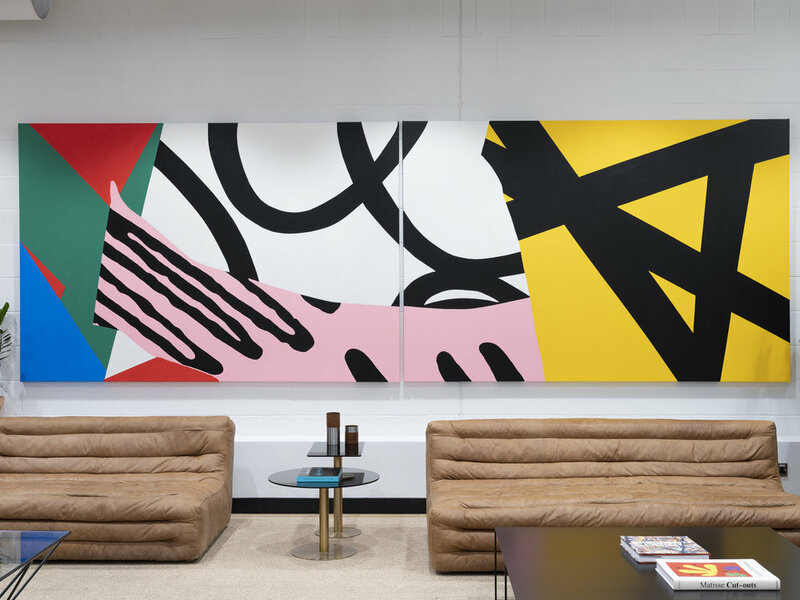 Stepping into the lobby of the 90,000 square-foot building, you’re immediately confronted with a vast five meter-wide, energetic ‘Loose Ends’ diptych painting by Andy Welland. 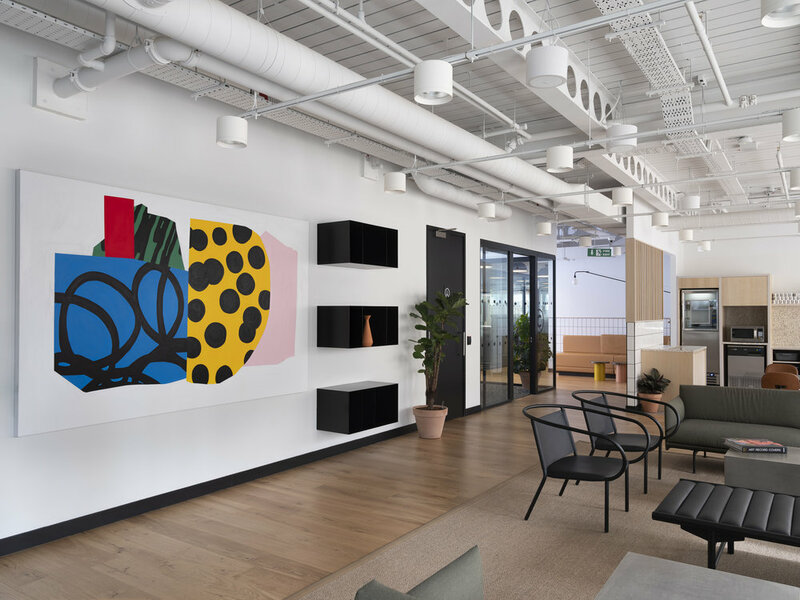 The four, site-specific works in this collection span three floors of the building and are eye-widening bright in colour; candy floss pinks and sun-kissed yellows are interrupted by the flow of graphic black scribbles and doodled dancing lines. This collection of graphic collages are the product of Welland’s background and career bridging the disciplines of a Fine Art education and career in graphic design while reflecting upon more profound influences and attempting to make sense of the world. The seductive and graphic aesthetic of the works lends itself to a contemporary entry point for engaging with the paintings. Papercut-style forms are assembled, bumblebee-like black/yellow spots and lines are applied to brightly coloured off-cuts as each form is layered upon the next. I don’t see the relationships between design, art or handmade and machine as a tension, but more of a purposeful oscillation. It is a back-and-forth process; like a game of ping-pong between disciplines, conceptually and within the modes of production. The ideologies aren’t sparring; more like exchanging love letters and helping each other out. For example, by playing with scale, the small, minute details become important anchor points of tension and dialogue. “For some context, before I started art school it was the dawn of the mainstream internet, and there was an optimistic, yet a vague sense of what things could be. Social media wasn’t yet a thing — You’d stumble into little digital communities, people trying to make sense of it all. Message boards existed where all kinds of people put experimental work up, create memes before memes were a thing and programmers would hack and play with web code and even break the fabric of the website. It was a wonderfully confusing, weird conceptual mess. There was also a real mix of analogue and digital materiality around us. My housemate and I would take MP3 music files from Napster, burn them into mix CDs with hand-scribbled track listings. The discs would usually end up being passed and shared between friends or end up being used by my housemate to DJ at the local rock club. I still love the idea that something ethereal can exist, floating in space and given a physicality. During this time I would collect found gig flyers, graphic design ephemera and make collaged posters and cards for friends – a mix of figuring out Photoshop and physical cutting and pasting from the bits of ephemera I’d collect. Andy Welland (b. 1981) is a British artist living and working in the UK. 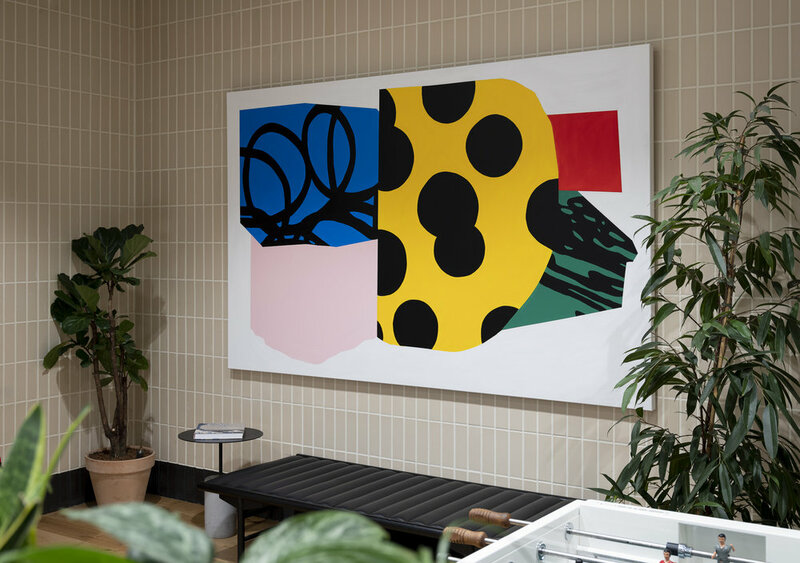 He is recognised for his vibrant, graphic collage work that is both welcoming and bold with a sophisticated conceptual edge. 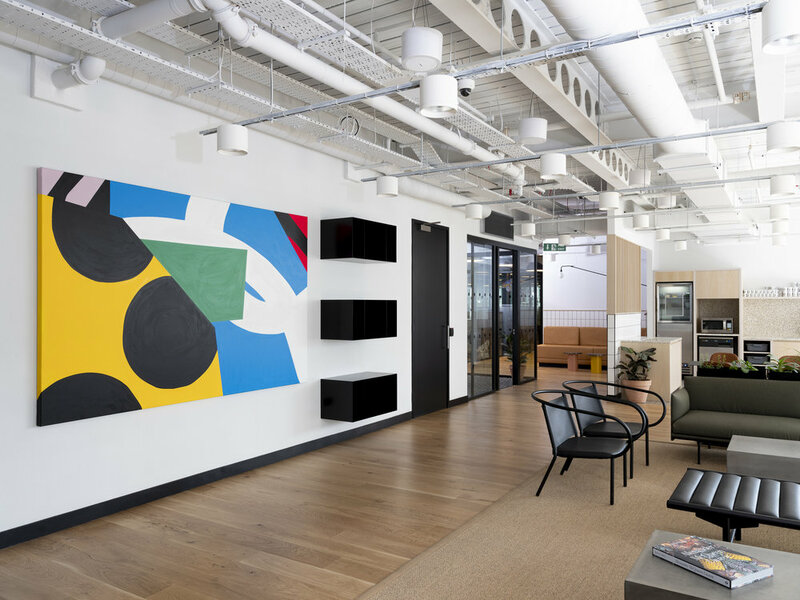 Following a degree in Fine Arts from Sheffield Hallam in 2007, he cut his teeth in London working within the luxury division of M&C Saatchi and has also worked at various boutique design studios across the UK. As an accomplished art director, he operates a design consultancy generating commercial work such as branding, conceptual R&D and publication design alongside his art practice.